Could King George victor be flying too high if he takes in the Arc? Betting News > Horse Racing > Arc de Triomphe > Could King George victor be flying too high if he takes in the Arc? A thrilling photo finish saw Postponed see off old foe Eagle Top to land the King George on Saturday, but with his connections eyeing up an Arc crack they have their sights set on an even bigger prize. The weekend’s big contest lost some of its appeal when unbeaten Derby winner Golden Horn was ruled out of the race due to the soft ground at Ascot following Friday’s deluge of rain. Nevertheless, this only made the race even more intriguing, with little to choose between many of the runners. As push came to shove in the latter stages of the Berkshire straight, it became clear that it was a two horse race. And it was two horses that were involved in a barging match at the Royal meeting in the Hardwicke Stakes, leaving John Gosden furious. Now with new jockey, Andrea Atzeni, Postponed drew alongside Frankie Dettori and Eagle Top, in what was a ding-dong battle in the second-richest flat race in the UK. A photo finish declared the former the victor, a first Group 1 success for the son of Dubawi, and a whole new kind of challenge catapulted to the forefront of connections minds. The Prix de L’Arc de Triomphe has been mooted as the target, with both the winner and runner-up entering Ladbrokes’ market as 12/1 shots. In truth though, this wasn’t a strong renewal of the King George. With Golden Horn scratched it became the first running of the race in nearly 25 years that featured fewer than two previous Group 1 winners. If Luca Cumani’s horse is to spring a surprise he is likely to have to see off multiple horses that have delivered on the world’s biggest stage. And while he clearly coped with the cut in the ground that was prevalent at Ascot, the winner would have no doubt appreciated a sounder surface. That would be unlikely in Paris, with the vast majority of recent runnings seeing plenty of give at Longchamp. 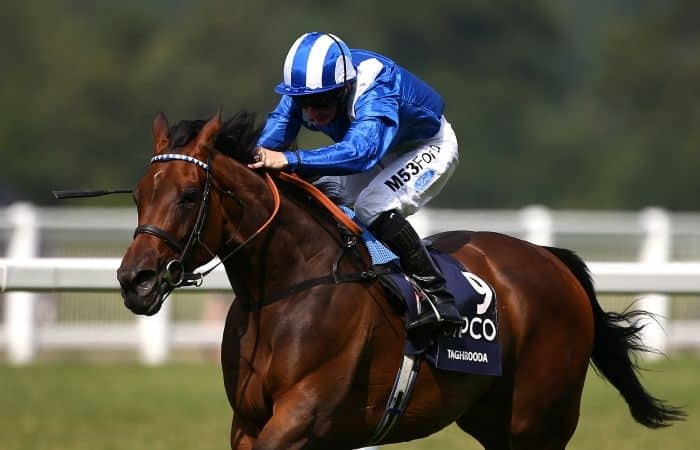 King George winners have a fair place record in the French race, with the likes of Taghrooda, Conduit and Hurricane Run making the first four in the Arc after taking the King George. Whether Postponed is up to the level of those performers remains to be drawn into question. In this writer’s mind at least, it is a surprise that a trip Stateside isn’t the plan for the four-year-old. The winner of this weekend’s race automatically earns an entry in the Breeders’ Cup Turf, and with the word ‘firm’ often in the description in the US, conditions would be ideal. But you have to give credit for connections to aim big in what would be a mammoth shock in France, especially if Golden Horn lines up to bring the curtain down on his career in style.